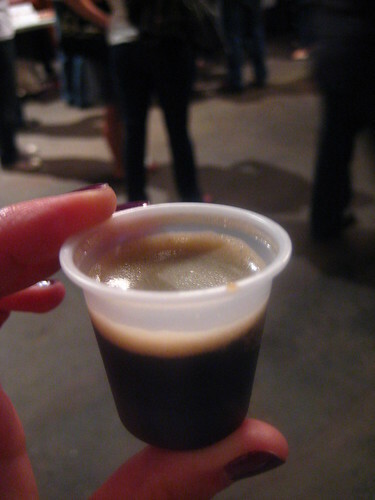 Somewhere between Octo-Burlesk and Shacktoberfest, I forgot to talk about the cheese at The Brooklyn Cheese Experiment. So, before I talk about anything else, I have to get this out! If there is one thing Dewey Decimator knows, other than the Dewey Decimal Classification, it's 641.373 (cheese) and 637.35 (cheese, varieties of). She was going to this competition with me, whether I liked it or not. As usual for us, we were there as the doors opened, ready to eat each and every entry. 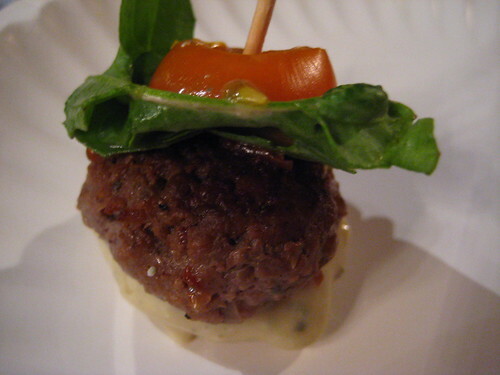 It all began with The Stinky Slider, which was tasty, pungent, and presented very well for a food competition-notice the toothpick holding it all together and one bite size. 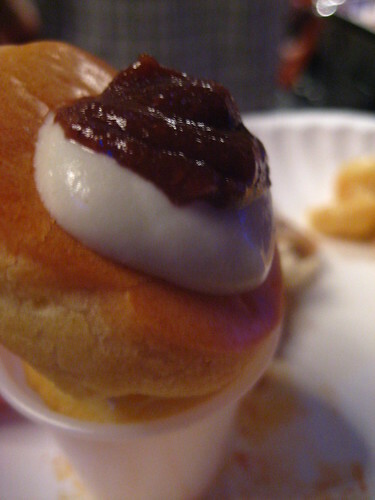 Another stinky was the Fig & Blue Cheese Puff. 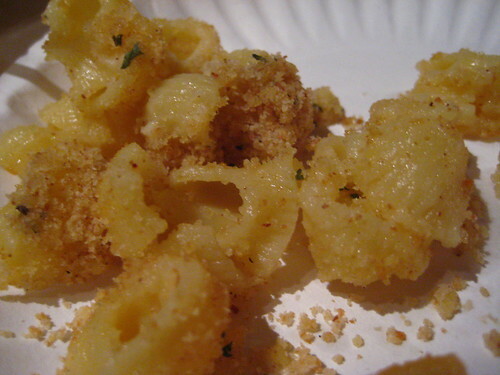 The puff was wonderfully baked, and the cheeses and fig complemented each other. My only problem was the easy roll off of the cup holder, because I caused a "puff down" by being unable to control the roll. 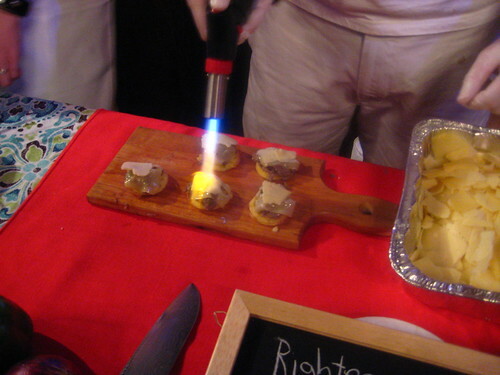 There were at least two torches, one for melting Swiss and Gruyere on the Righteous Bun. 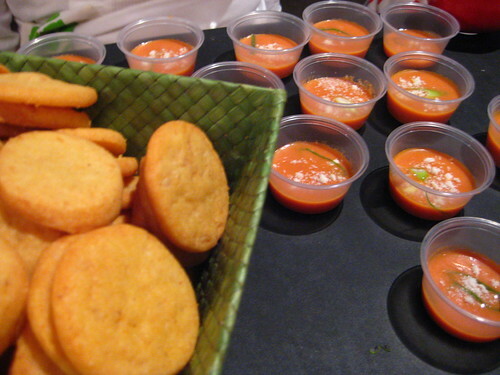 Bonnie Suarez represented with a cheesy tomato soup with spicy crackers. Not being a soup person, I liked the spicy crackers. Dewey liked both. 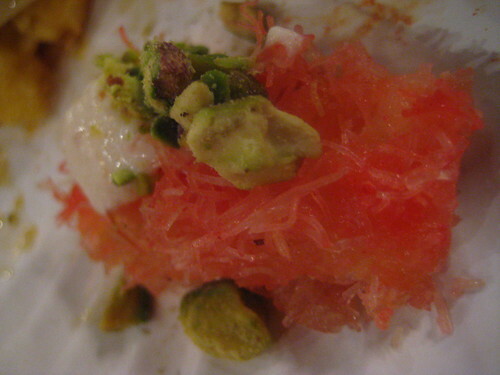 One of her favorites was the Knafe Nabulysa with Akkawai & Rose Syrup. It was very different, and very interesting. It's for unique dishes like this that keep me going to food competitions. I like saying "Wait, what?!" We were expecting copious amounts of macaroni and cheese, which we got. 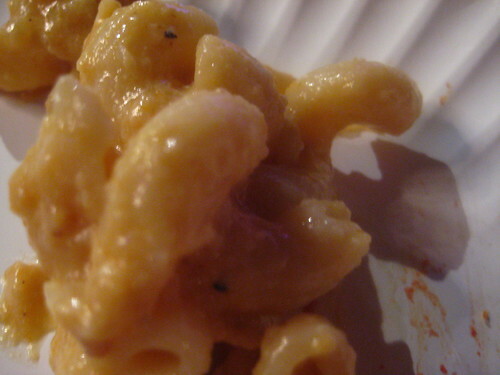 Each had its own spin, but both of us ranked the Pumpkin Mac & Cheese highest. 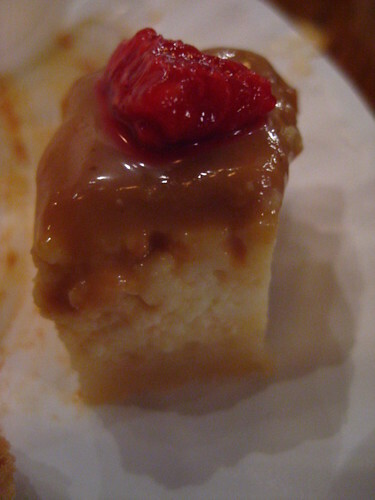 What we didn't expect was a lack of desserts; the one we tried was a very good cheesecake. The perfect ending to line of participants. Of course, on the other side was the beer. If I said I remember what we liked best, I'd be lying. Stayed tuned to thefoodexperiments.com for the upcoming Experiments, and chili-takedown.com for the upcoming Takedowns. For a behind the scenes look at what it takes to be a contestant and/or Bonnie Suarez's winning recipe, check out Not Eating Out in New York's Cathy Erway's experience. Great pics! Theo and I are planning the Brooklyn Chocolate Experiment for November 15th. More details to come! The names are so appropriate and funny! I came across your site from a Google alert for "cup holder". Since my product's blog is related to this, and because Google is fond of content related links, I was hoping you'd be interested in a blogroll link exchange. This is where I link to your site, and you link to mine.